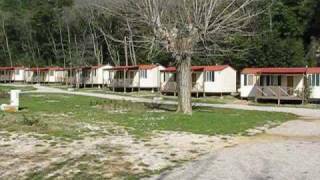 Autocamp Medveja is located close to a long pebble beach on the Opatija Riviera. Surrounded by Mediterranean greenery at the foot of the Ucka Mountains, it is a good base from which to explore the wide range of leisure facilities along the coast, with its warm, clear blue sea. Medveja has 280 stony pitches with 200 having electricity and 96 having water as well. In addition, Medveja Holiday Resort includes apartments and rooms in bungalows, rooms in the Villa Medvejica, and 40 new premium mobile homes that are equipped with air-conditioning, satellite TV and an outdoor terrace with grill. The lush backdrop of the Ucka Mountains offers many walking trails and opportunities for other outdoor activities that you can enjoy while camping in Medveja. It is also a great base for lovers of nature and families with children. After a mountain hike, you can cool off with a swim in the Adriatic Sea, just a short walk from the camp. At the beach there are numerous water sport options, such as scuba diving, parasailing and canoeing, as well as a varied entertainment programme. Three adequate toilet blocks. Toilet for disabled visitors. Washing machine and dryer. Bar, snack bar, restaurant (from May). Barbecues are not permitted. WiFi throughout. Leave A7, Rupa/Rijeka motorway about 13 km. south of Rupa, just north of Rijek. 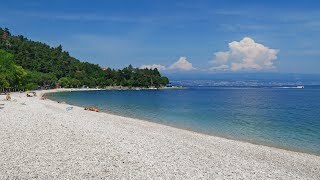 Take A8 west and immediately turn south, Nova Cesta road, through Opatija. Continue on D66 to Medjeva and follow signs to site which is directly beside the main road.